The customer life cycle is a series of steps a customer goes through when making a decision to purchase or use a product or service. There are many different models that take you through you this, but most have in common the following stages: Awareness, Interest, Desire, Action and Loyalty (also known as the AIDA model). Back in ye olden days of marketing, managing this life cycle was a relatively easy feat between the company and consumer. The marketing agency would corral customers through each stage, taking them from an advertising campaign that piqued their interest and following up with a survey/discounts to inspire loyalty. But in today’s age of YouTubers, Instagrammers and more user-generated content than you can poke a stick at, things aren’t as straightforward. Consumer to Consumer (C2C) conversations are taking place daily as I was reminded of recently when I went to purchase my new glasses. Let’s see how Oscar Wylee took me through the life cycle through their own channels (specifically their Instagram and website) and have created a community that helps customers through this cycle. About 6 months ago, it felt as though I couldn’t open up Instagram without seeing someone rocking a pair of Oscar Wylee glasses. 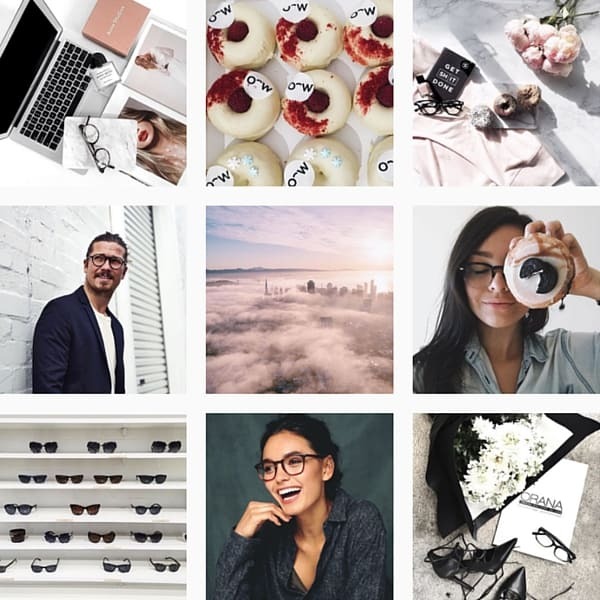 Beautifully styled flat lays, cool kids in equally cool frames, all marked with the #OscarWylee hashtag. When I got to the brand’s Instagram account, I could scroll through consistent brand images, regrams of some of my favourite accounts, and all the information to get to their website. Developing a strong community online is invaluable – their reach is likely to be greater and their content more authentic than yours. When the need for new glasses came up, I headed straight to the Oscar Wylee website. I had certain criteria in mind: find a pair of modern frames that would suit my face, preferably through my health fund. Almost as though they were anticipating my needs, my concerns were answered on the home page. I could click through and read up more on cost if my health fund covered my purchase and discovered that I could select a variety of frames and have them sent to me at home for me to try on. Whether it’s a lead, subscription or customer that you’re trying to convert, you need to make important information as easy to find as possible. I’m officially interested. After opening approximately 52,293 tabs in my browser, I began culling and compiling my favourite styles. After a quick scroll on my phone at some of my favourite Instagram accounts, I begin honing in on what designs my favourite bloggers wear and could look them up on the website. The site uses a combination of product photography that shows details up close, as well as what they look like on people’s faces. Additionally, they offer descriptions of their specific frame designs frames like “witty and curved which works beautifully on medium-sized faces” – if that doesn’t describe me I don’t know what does. They talk like me, they look like me (well, the airbrushed version of me at least) and I’m convinced I’m going to be that much cooler with these glasses in my life – Got. To. Have. Them. Sharing tips and advice and appealing to emotions can make your products and services seem more desirable. There it is. The shiny blue “add to cart” button. I’ve done my research and know that I can claim on my health insurance, I won’t baulk at the shipping costs (cos it’s free) and I’m feeling confident about making a purchase. Lo and behold, I bite the bullet and click away. Make it really easy for people to convert. Like, stupidly easy. Make your call to actions obvious and simple to follow. Offline, my face is doing a pretty great job of turning people onto the brand, with at least 5 friends asking me where I got my glasses. And while my glasses-donned Instagram selfie is still a work in progress, every time I see a picture of another #OscarWylee girl in my feed, I do feel a little bit like I’m part of an exclusive club. And hey, I’m telling you about it now, aren’t I? Reward your loyal users by giving them shout-outs on social media – not only is it great content to top up your content calendar, but you’ll be more likely to retain a customer that feels like they’re a part of your brand. What brands do you think are doing a great job of taking you through the customer lifecycle? Let us know on our Facebook, or drop us a line.